A few weeks ago I told you the story behind my favorite couple's gift shop, Chester and Hester's Dinosaur Treasures. Now, I am finishing this tale with the back story of the neighboring Dino-Rama. Yes, this is an area of the park that just gets lambasted by the Disney fans. The complaints? It looks cheap. Carnival games? Not in my Disney park. And plain old concrete, what the hell. All are true and that's the point. Chester and Hester wouldn't have it any other way. The one complaint I vehemently disagree with is there is a lack of theming here. Hey, you might not like the theming but it sure is heck is there. Chester and Hester's grew from a gas station to a gift shop to take advantage of tourists who wanted to check out the dino bones. Then something incredible happened. The nearby Dino Institute discovered time traveling and started sending people back in time to check out dinosaurs in the flesh. The old holdouts Chet and Het were cashing in. And with more and more tourists flooding the area, they decided to expand out. 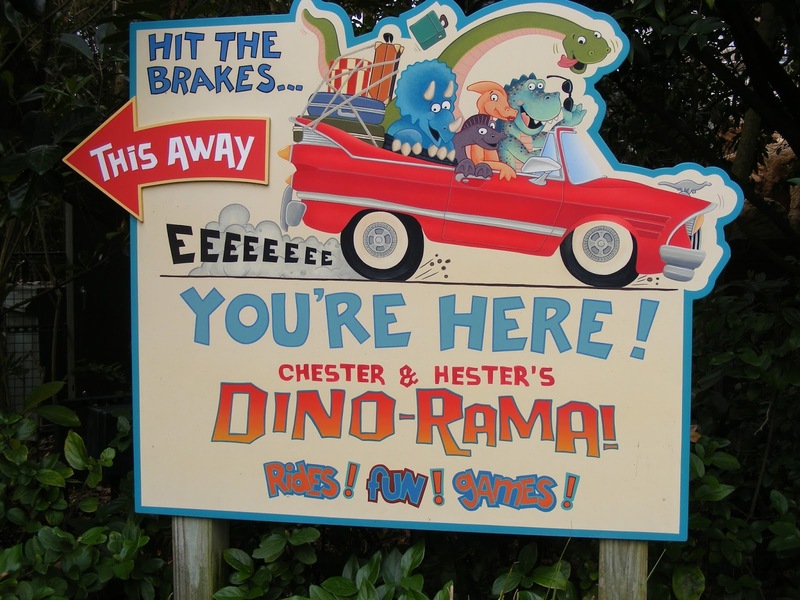 Hence, Chester and Hester's Dino-Rama. So, do you think an old couple with a kitschy gift shop would have the hard cash to build a state-of-the-art theme park? Of course not. Instead, you have some carnival games and two off the shelf rides. That is exactly what you would expect of a roadside attraction. But, even the attractions are themed and many don't even know it. First of all, there is triceratops spin, the spinner ride wherein you ride flying triceratops. Now many people wonder why on God's green earth did Disney pick triceratops. I mean, after all, why not pterodactyls. They fly. Well, that's cause Joe Rohde is a genius. Triceratops are iconic and that's what Chester and Hester would pick logic bedamned. Kids know triceratops they would rather ride in a triceratops. And look at Primeval Whirl. Not the ride, but the signs. 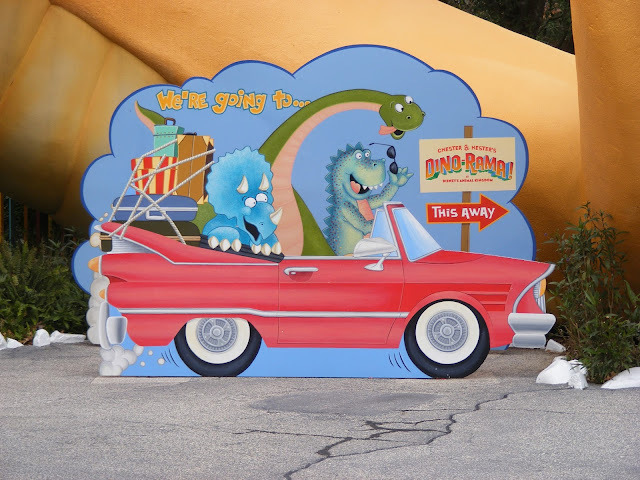 You will see that you are on a much cheesier version of the Dinosaur attraction. The scientists in the queue are sending you back in time (check out the spinning clock as you ascend) to see dinosaurs. And just like the Dinosaur ride, a meteor comes at you right before you are sent back. There are also carnival games that seem more at home on the Boardwalk then here in this theme park. But again, that's the point. These would be sure fire ways for Chester and Hester do increase profits and that is why they are there. Cash cows, if you will. There is the Dino Whamma, Fossil Fueler, Mammoth Marathon, Comet Crashers, Bronto-Score, and my favorite, the whack a mole inspired, Whack-a-Packycephalosaur. Yes, these are dumb side show games. And yes, they actually cost money to play which is why almost no one ever does them. But they fit in perfectly. And there are other silly carnival things like a mirror that changes your shape, a photo booth and a cardboard stick your head in it and take a silly picture thingie- I have no idea what those are called but you know what I mean. Maybe the most thematic part of this area is the concrete. Yes, the concrete. This is a roadside attraction so of course, there should be a highway. 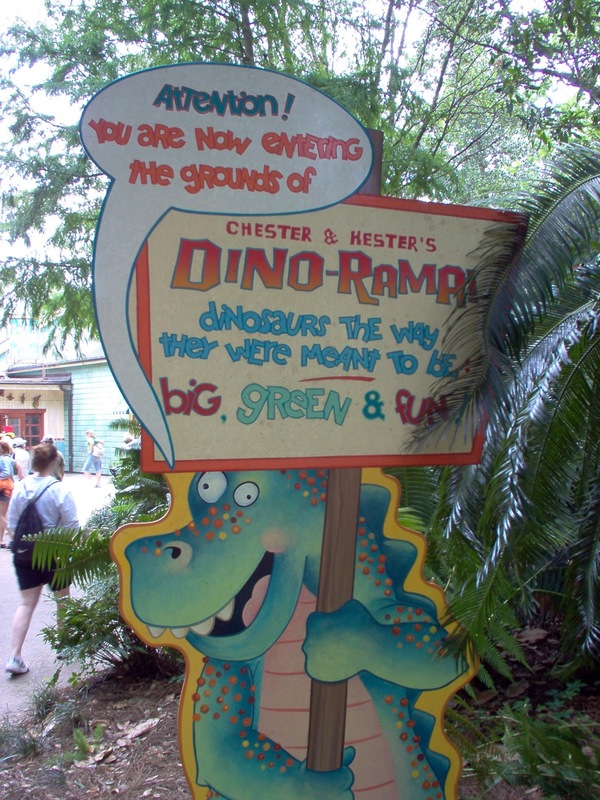 Look at the signs leading up and into Dino-Rama. They are typical of roadway signs you would see out west trying to get your attention to stop in and have a look, i.e. spend money. My favorite is the "Dusty old bones getting you down? Try Chester and Hester's Dino-Rama for fossil free fun." So, Disney fans take solace in the fact that is area IS well themed and have fun. Yes the area is themed, but well themed? I myself and most people seem to say no it's not. Cheesy just doesn't fit when the rest of the park is so magnificent. I think just because the imagineers put a back story to the area doesn't make it good. Disney could have done so much more with a Dinosaurs themed area and could have had it fit in with the splendor of the rest of the park. Cheesy amusement areas are for other parks, not Disney ones. Especially one so majestic and amazing as the Animal Kingdom. A Photo For Today: Grow Eyes for Poachers! Episode 5 of Radio Harambe is Now Available! Rohde Vows to Fix the Yeti "Someday"
Radio Harambe Episode 4 is Now Available!